I could find no description of the case in Section V.
What this says is that we are hearing what William Nash states the witness told him. I have no doubt that Nash tried to accurately report the story but one has to wonder how much of his own bias affected the reporting of what Mueller told him and what details may not be correct. Researching further, I noticed that Dr. McDonald briefly mentioned the case in his discussion of Chiles-Whitted.3 He states that it was a TWA flight. His source was the CSI newsletter of February 29, 1956.4 Fortunately, that is available at the CUFOS web site. It included the sketch made by Mueller. However, they indicate he was a PAA flight engineer. They state the plane was near New Orleans when the UFO was seen and it was brief to the point that the co-pilot, who was not looking forward at the moment, had missed it when he faced forward. The Project Blue Book has a case file for January 22, 1956 from Miami, Florida.5 The time listed is 1925Z (1425 EST) but the message also mentions it was at night, so this time is probably in error. It describes an object going from SW to NE. Blue Book identified this as a meteor and mentioned that there were also reports from St. Petersburg around the same time. This meteor was also men- tioned in the CSI newsletter. They clarify that the time was 1925 PM and not Zulu time indicating the Blue Book time was in error. The coincidence of a bright meteor being visible from Florida makes one wonder if what Mueller, who was flying in that direction, saw was the same meteor. The only problem is the times do not match. Is there a reason for this? Looking at the airline time tables from the time period, there appears to have been no direct flight from Houston to Miami sched- uled by PAA. In fact, the time tables indicate that Pan American used other airlines for connecting flights inside much of the US. National, American, and Delta seemed to be the air carriers used by PAA for connecting to Miami. Finding a flight that matched the description was difficult since there were no non-stops from Houston to Miami. 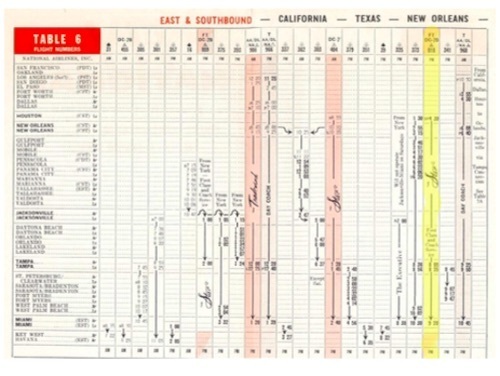 According to the July 1, 1956 PAA timetable, there was a flight that went from San Francisco to Miami, which landed in Miami around 2300 EST.6 However, it stopped in New Orleans and not Houston. It was scheduled to arrive in New Orleans at 1823 CST and leave around 1850 CST. This flight was a combination of American, Delta, and National airlines flights. The National Airlines flight timetable of 19547 and 19588 states it actually stopped in Tampa en route to Miami. This flight can also be found in the American airlines timetable of 19559 and the Delta Airlines time table of 195810. The National Airline flight indicated there was a stop in Dallas along the way. In none of these tables, is Houston even mentioned. If it were this flight, and it were on schedule, the plane would have been in the vicinity of New Orleans between 1800 and 1900. There is one other flight possibility that actually went from Hous- ton to Miami. The National airline timetables for 1958 listed a flight from Houston to Miami with a stop in Tampa.11 This flight left Houston at 1630 CST, stopped in Tampa at 2005 EST and ar- rived in Miami at 2120 EST. It is about 800 miles from Houston to Tampa, which took roughly 150 minutes. A plane flying at this speed would be in the vicinity of New Orleans between 1730 and 1800. This is the only flight that matched the description but it may not have existed in 1956. This reason for identifying the flight is to see if what Mueller saw was the 1925 EST meteor. 1925 EST would have been 1825 CST. It is possible that Nash either transcribed the number incorrectly or heard “eight” instead of “eighteen”. This scenario is consistent with the flight timetables because the 2030 EST/CST time frame does not match a proximity to New Orleans for either flight un- less the plane was significantly behind schedule. Meanwhile, the 1825CST time frame puts the plane in the general vicinity of New Orleans. This has all the characteristics of a bright meteor. The fact that a similar object was reported on the same evening from Miami and St. Petersburg with a similar trajectory is difficult to ignore. Mueller or Nash may have gotten the time of the event incorrect. Even if the time is correct, it could be that Mueller saw another bright meteor that evening. There is no reason to reject the meteor explanation and this should be removed from the “best evidence” document.